Changing general surgery procedures could improve care for patients and save the NHS millions. The NHS could see a significant reduction in the amount of people unnecessarily admitted for emergency general surgery if more acute hospitals introduced consultant-led surgical assessments at their ‘front door’, says a health improvement programme. Analysis by the Getting It Right First Time Programme (GIRFT) shows this change could lead to up to 30% fewer general surgery emergency admissions a year where no operation is delivered, and could cut the NHS’s annual cost for this (£361million) by £108m. This is one of 20 recommendations from GIRFT aimed at improving general surgery in order to provide better outcomes for patients, and eliminate unwarranted differences between hospitals in areas such as effective procedures, length of stay, infection rates and procurement costs. Mr John Abercrombie, a leading colorectal surgeon and author of the GIRFT national report into general surgery in England, identifies recommendations that would particularly benefit patients by helping to shorten the time they spend in hospital; and by reducing complications that can lead to readmissions. In turn, this would also generate savings for hospitals by freeing up beds for other patients. A reduction in the length of stay for elective colorectal surgery patients from the current average of 10.2 days to the 5.5 days in the best performing hospitals, would ensure patients didn’t have to stay in hospital for so long and would free up to 84,000 bed days, equivalent to a saving of £23.6m. A reduction in the length of stay for appendicectomy patients from an average of 3.5 days to 2 days would ensure people were back home more quickly and would free up 30,000 bed days for other patients, equivalent to a cost reduction of £8.5m. Reducing elective general surgical admissions without any surgical procedure, which are rarely necessary, would save close to £7m a year. Reducing some hospitals’ high levels of emergency readmission at 30 days for gall bladder surgery to the national average would save £1m in bed days. Similarly, if providers with high 30 day emergency readmission rates following appendicectomy reduced their readmission rates to the national average, this would free up £5.8m worth of bed days. If all patients received gall bladder surgery within 14 days of diagnosis, as opposed to the national average of 23% of patients, more people would be treated in a timely fashion with fewer readmitted for later surgery, and up to £5m saved. If all trusts reversed surgical stomas following colorectal cancer resection, where appropriate, in the recommended time frame of 6 months rather than 18 months, this would provide a better experience for patients and could save almost £2.4 million annually. For a basket of surgical supplies, procurement costs varied from £1,467 to £2,336. If all hospitals procured these items at the lowest price, national costs would reduce by 59%. Mr John Abercrombie’s recommendations were developed by reviewing data from all acute hospitals in England and visiting 50 general surgery departments. The recommendations have also been fully endorsed by the Royal College of Surgeons. He explained: “By looking at the trusts’ own data I’ve been able to have a frank discussion with clinicians and managers about what’s working well and areas for improvement. GIRFT’s focus on identifying unwarranted variation provided us with the opportunity to understand why differences exist, discuss the challenges trusts face and look for ways to improve services which will benefit patients and make trusts more efficient. An increase in the amount of day-surgery for some procedures so people can return home more quickly. Minimising problems that can result in longer hospital stays or readmissions, as well as changes to pre-operative treatment that could help reduce surgical complications. Better use of data to reduce variation in general surgery performance and to identify treatment pathways with the most effective outcomes for patients. Identifying optimal treatment pathways with the most effective outcomes for patients. Increased use of perioperative medicine to address ‘reversible risk factors’ prior to non-urgent procedures. Measuring surgeons against new national clinical standards to help them get a better understanding of their own performance in areas such as infection rates. GIRFT is a national programme created and led by consultant surgeon Professor Tim Briggs who ran a pilot programme in orthopaedic surgery which helped to save £30m in the first year and a further £20m in the second year. By 2021 it is expected the GIRFT programme will have created opportunities to improve patient care nationwide while also saving up to £1.4bn annually. Professor Briggs is GIRFT Chair and National Director of Clinical Quality and Efficiency at NHS Improvement. 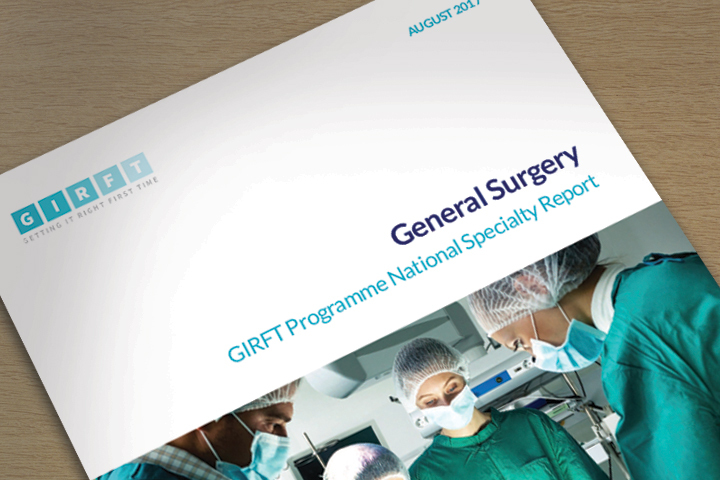 The recommendations of the general surgery national report will be delivered by GIRFT’s implementation teams, working with NHS Improvement and alongside bodies such as NHS England, NHS RightCare and the Royal College of Surgeons, as well as directly with the trusts, Clinical Commissioning Groups and Sustainability and Transformation Plan footprints.